The last leg of our Eurotrip was spent in London - a city I was so excited to finally see for the first time! And I have to say, it ended up being wonderful in so many more ways than I expected. One major item on my bucket list for London was afternoon tea at the Ritz Carlton. If you're an afternoon tea lover, London is the place for all things tea. The Ritz London is considered the home of one of the best afternoon tea services in the world, so naturally it was a must-try. We dressed up in our very best (they're not kidding about the dress code - we saw two guys being given ties and jackets to wear) and enjoyed an amazing afternoon tea service in their beautiful tea room, the Palm Court. It was a beautifully decorated room, with live piano music playing, staff decked out in chic suits, and the tables set with the most gorgeous silverware. After all our afternoon tea tastings back home, we've become accustomed to some pretty creative high tea spreads. This was certainly not the case here: it was a far more traditional selection of afternoon tea foods, including finely cut sandwiches, scones and tea cakes and pastries. But there's something to be said for the classics. They definitely do them very, very well. The food was delicious, the service was impeccable, and we enjoyed the added bonus of an extra dessert, which was brought around on a rolling cart for us to choose a slice. It was a lovely experience, one I would gladly do again! 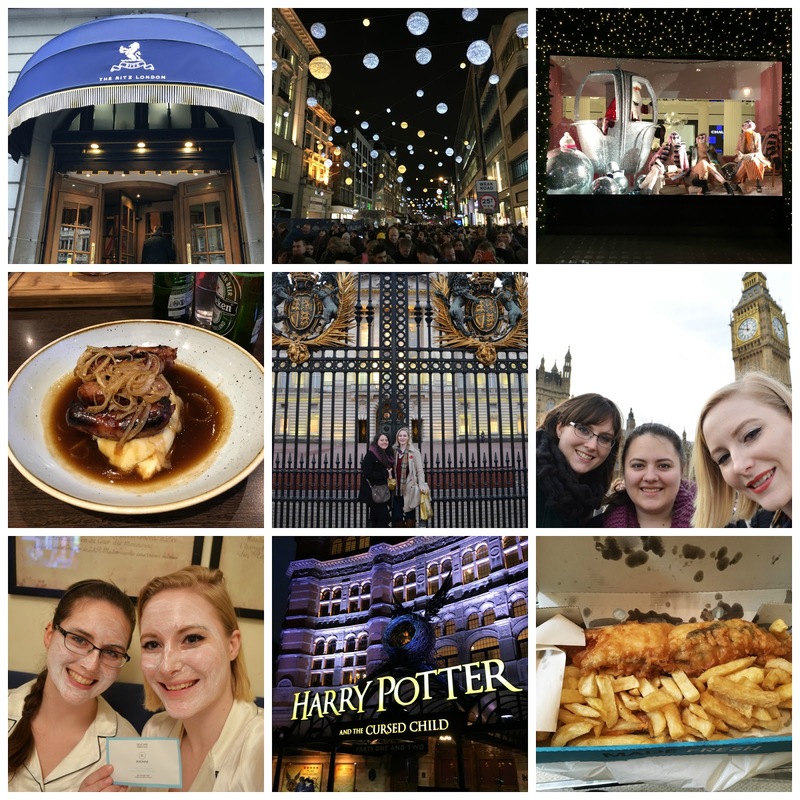 Our first few days in London also included all kinds of other exciting experiences, like the lighting of the Christmas lights along Oxford Street, eating traditional bangers & mash (yum!! ), visiting Buckingham Palace, seeing Big Ben and eating traditional fish & chips. Naturally, I had to pick up some tea-related souvenirs while at Buckingham palace, including some beautiful golden spoons and a tin of tea (you can check them out on my Instagram here). We also longingly walked by the theatre for Harry Potter and the Cursed Child. It would have been incredible to see the play, but sadly it's sold out. Oh, and we can't forget our visit to Selfridges on Oxford Street, which was a must-visit after watching Selfridges on Netflix. To be honest, it was nothing compared to Harrods, but more on that in my next post. We also had some much-needed relaxation and girl time at our AirBNB with cheap wine and our Racinne face masks! More on our adventures in London in my next post, so stay tuned.